Dubai, Dec 2: In a new historic achievement, the UAE passport has become the strongest passport and now ranked first globally. The exceptional achievement on December 1, 2018, coincides with the 'Year of Zayed' and country's 47th National Day, and is added to country's numerous accomplishments in various domains. في يومنا الوطني المجيد .. توالت إنجازاتنا .. قبل قليل صنف مؤشر passport index جواز الامارات ليكون الأول عالميا بدخوله ١٦٧ دولة حول العالم بدون تأشيرة .. العالم يفتح أبوابه لشعب الامارات.. الف مبروك للامارات.. وكل الشكر لفريق وزارة خارجيتنا الاستثنائي بقيادة أخي عبدالله بن زايد . This success was achieved by the Ministry of Foreign Affairs and International Cooperation under the leadership of Sheikh Abdullah bin Zayed Al Nahyan, Minister of Foreign Affairs and International Cooperation. In his remarks on the occasion, Sheikh Abdullah said, "This achievement is a true reflection of the legacy of Sheikh Zayed, the Founding Father of the UAE. It also underscores what can be achieved through positive diplomacy, reflecting the UAE as a confident and engaged force at the global stage." بفضل من الله تعالى حقق جواز دولة الامارات المرتبة الاولى عالميا، إنجاز يعكس صواب نهجنا ورؤيتنا المستقبلية فشكرا لفريق العمل على جهودهم المشرفة، تعزيز مكانة الامارات وترسيخ سمعتها الطيبة وتيسير شؤون مواطنيها من صلب سياستنا الخارجية، هنيئا للقيادة ولشعبنا هذا الانجاز المشرف. 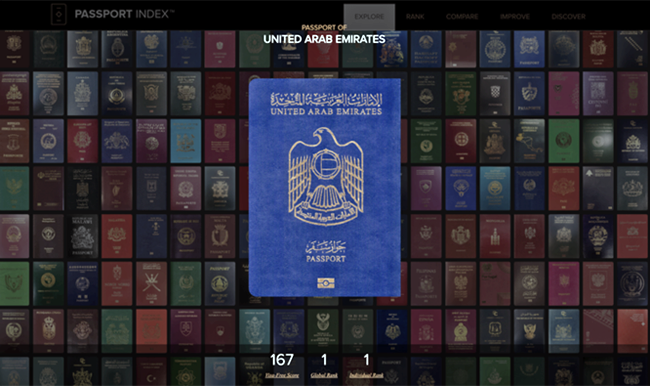 The UAE passport was ranked first by Passport Index, an interactive online tool that provides users with insights on passports with the ability to compare and rank the world's passports. The ranking is based on freedom of movement and visa-free travel to passport holders. The UAE passport holder can travel to 167 countries without the need for pre-visa requirements, which is 84 per cent of the number of countries listed in the index. The UAE passport was on 27th position in December 2016, and now has attained first place globally in December 2018. This achievement mirrors the county's civilised face, respect and appreciation at the regional and international levels. It is supported by a wise policy and leadership that has been working hard to build the country's bright image abroad to make it a hub for wisdom, moderation, coexistence and peace. The Ministry of Foreign Affairs and International Cooperation launched the UAE Passport Force initiative to place the Emirati passport on the list of the five most powerful passports in the world by 2021, however, the country has achieved this goal three years before the dateline. The strength of the passport does not only represent the identity of the citizen but also an important factor affecting its access to global opportunities, ease of movement and quality of life. 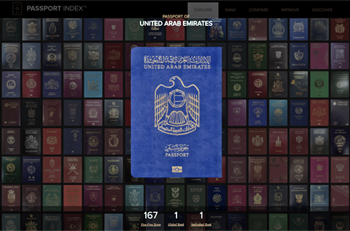 The Passport Index issued by the Arton Capital, ranks countries' passports based on the number of countries a passport holder can enter without obtaining a visa or obtaining it at the time of entry. The Index is a global benchmark for classifying international passports and reflects the world's view on the power and impact of passport. Armand Arton, Founder and President of Arton Capital, said that Passport Index is the most prominent rating of passport strength through an interactive platform that continuously monitors changes and developments, adding that it has become the world's premier reference for governments. "We continuously compare the passports of 193 countries and 6 regions of the UN members and work to collect data directly and continuously, all through publicly available information, government sources and international bodies. We determine the strength of the passport based on the ability of the citizens of a country to travel to another country without the need for a visa in advance and obtaining visa access from the airport," said Arton. He added, that the Emirati passport has witnessed unprecedented progress globally in the past few years, reflecting the international stature of the country. "We congratulate the UAE on this great achievement, and are pleased to work with the Ministry of Foreign Affairs and International Cooperation since the launch of the UAE Passport Force initiative," he went on to say. Through this achievement, the freedom of movement to many countries of the world is added to the list of priorities that the UAE offers to its citizens. The positive impacts for ease of travelling are not only making it possible for UAE nationals to travel freely for tourism, but also have economic, developmental and even humanitarian benefits by facilitating trade and economic investment for individuals and institutions. In line with a comprehensive vision of the development of the country and society, the UAE has a future agenda that embraces innovation, empowering the community and encouraging international cooperation and participation. These principles have been an integral part of the UAE since its establishment in 1971.